September is kitchens month at Oxford House. Shoppers can benefit from free Bosch appliances with the purchase of a Nobilia Kitchen. A free Bosch dishwasher is also being given away as part of its appliances package. 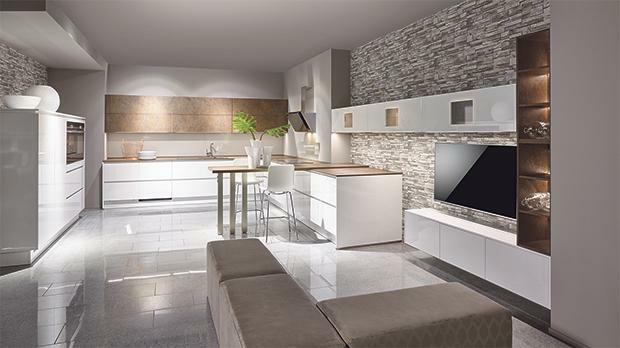 German brand Nobilia offers the latest range of kitchens with new features and models. For those considering buying a new kitchen, the Line N offers clean lines, refined materials and clearly structured architecture. This linear design, with new handless features, ensures a coordinated overall appearance throughout the kitchen – flawless aesthetics with lighted recessed handles and functional inner workings. Line N is available on various models with high-quality lacquered fronts or finished matt fronts. Oxford House are able to offer suggestions and ideas to help create your dream kitchen. At its showroom in Mriehel one finds a choice of kitchens with various décor elements, colours and finishes. The kitchen sales and design team can help with useful information before the purchase. Nobilia offers a mix of both modern and classic elements that allow both colour and front combinations to create an impressive and unique charm. The modern cottage look is still popular with both young and old. Nobilia offers clear shapes, soft lines and natural decors and colours that are a characteristic of the modern cottage style. Cottage style brings along numerous charming details, such as wickerwork basket pull-outs, framed glass doors with antique inlay or bottle racks that lend an authentic appearance. Nobilia is known for storage and innovative ways how to make lives easier in the kitchen. An optimum lighting plan is also indispensable in the kitchen. Oxford House designs, delivers and installs kitchens with reliability. Those confirming their kitchen order in September can benefit from a package of free Bosch appliances as well as a free Bosch dishwasher with their kitchen. Both the Nobilia kitchen and Bosch appliances are covered by a five-year warranty. Oxford House can be contacted on 2546 4000 or www.oxfordhouse.com.mt.